An international team of researchers using the 10m telescope at the W.M. Keck Observatory have discovered unusual class of galaxies, called ultra-diffuse galaxies, in distant space. These “diffuse” galaxies are 60,000 light years across — almost as wide as our own galaxy — but contain only 1% of the stars found in normal galaxies. These galaxies are so “fluffy” and “wispy” that astronomers have no ideea how they have formed. This new findings have been published in the Astrophysical Journal Letters. If the Milky Way Galaxy is a sea of stars, then these newly discovered galaxies are like wisps of clouds. Said Dr Pieter van Dokkum ~ lead author of the paper. We are beginning to form some ideas about how they were born, and it’s remarkable they have survived at all. They are found in a dense, violent region of space filled with dark matter and galaxies whizzing around, so we think they must be cloaked in their own invisible dark matter ‘shields’ that are protecting them from this intergalactic assault. Because they are so wispy astronomers have dubbed them “fluffy” (their correct scientific name is Ultra Diffuse Galaxies). 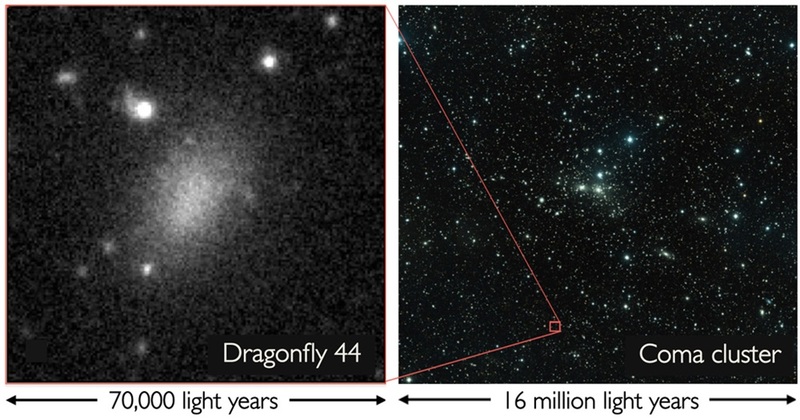 To made the discovery, the team used data from two telescopes, world’s smallest telescopes — Dragonfly Telephoto Array — with the largest telescope — Keck Observatory. DTA produced digital images of the very faint objects then using 10m Keck telescope astronomers separated the light from one of the faint objects into colours and diagnose its composition and distance. The results showed that the distance was what ‘seal the deal’ for researchers: this wispy galaxies are very large and very far away, about 300 million light-years away in the constellation Coma Berenices (near Leo). The ultra-diffuse galaxy 60,000 light years across. © P. van Dokkum, R. Abraham, J. Brodie. The big challenge now is to figure out where these mysterious objects came from. Are they ‘failed galaxies’ that started off well and then ran out of gas? Were they once normal galaxies that got knocked around so much inside the Coma cluster that they puffed up? Or are they bits of galaxies that were pulled off and then got lost in space? Astronomers found these galaxies in a region of the sky called the Coma cluster, where thousands of galaxies have been drawn together in a mutual “gravitational dance”. They are found in a dense, violent region of space filled with dark matter and galaxies whizzing around, so we think they must be cloaked in their own invisible dark matter ‘shields’ that are protecting them from this intergalactic assault. Our fluffy objects add to the great diversity of galaxies that were previously known, from giant ellipticals that outshine the Milky Way, to ultra compact dwarfs. If there are any aliens living on a planet in an ultra-diffuse galaxy, they would have no band of light across the sky, like our own Milky Way, to tell them they were living in a galaxy. The night sky would be much emptier of stars.